← BEACON Researchers at Work: Explain it to me like I'm a four-year-old. 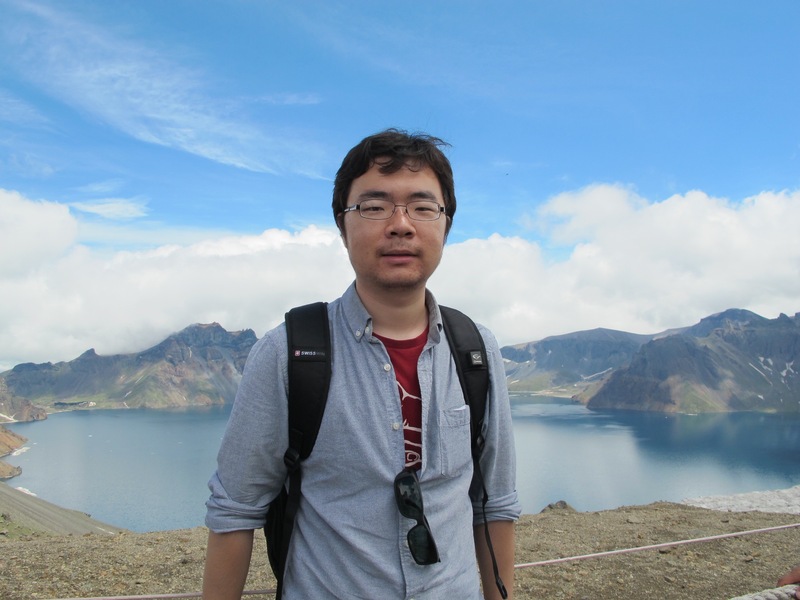 This week’s BEACON Researchers at Work blog post is by MSU graduate student Yiliang Wei. Hello BEACON members, I’m Yiliang Wei, a graduate student in the Arnosti Lab at Michigan State University (https://arnostilab.natsci.msu.edu). For my first blog at BEACON, I’m going to talk about my study of the functional diversity of the Drosophila Rbf2 protein, a recently evolved Retinoblastoma family member in Drosophila, and its possible role in regulation of ribosome biosynthesis. This study has been recently published on G3 (Genes|Genomes|Genetics) (doi:10.1534/g3.115.019166). Our lab has been studying Retinoblastoma (Rb) tumor suppressor proteins in Drosophila. 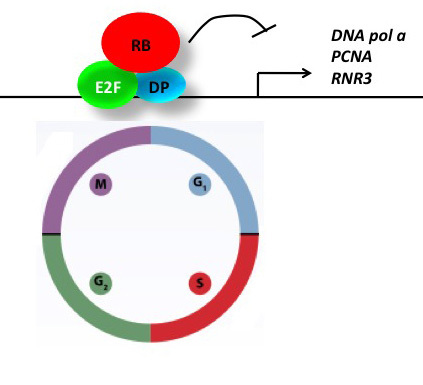 Rb proteins function as transcription co-repressors that bind to E2F/DP to control transcription of a diverse set of genes involved in cell cycle regulation. The Rb-E2F pathway plays central roles in cell cycle and development in most eukaryotes. The Drosophila Retinoblastoma family members Rbf1 and Rbf2 are structurally similar to their vertebrate counterparts and possess functionally conserved activities. A canonical model for Rb-E2F pathway. Rb proteins interact with E2F and DP, and repress target gene expression, such as cell cycle related genes. Many studies so far have been focused on Rbf1, since it has a dominant role in regulating the cell cycle control and mutants exhibit a lethal phenotype. A few years ago, our lab conducted a genome-wide analysis of the Rbf1 binding profile, and identified a number of non-canonical Rb targets, suggesting diverse functions of Rbf1 besides cell-cycle regulation, such as regulating signaling pathways (Acharya et al. 2012). This aspect of function of Rb appears to be conserved in mammals as well. On the other hand, the study of Rbf2 has been less intense, mostly due to the mild phenotype and weak transcriptional activity. However, as we turned our eyes to Rbf2, we found some interesting features of this protein. First, the genus Drosophila is different from most arthropods in that it possesses this additional retinoblastoma family member – most arthropod genomes encode a single Rb gene. Second, the Rbf2 protein contains a distinct, derived C-terminus when compared to Rbf1. It is known that the C-terminus of Rb proteins influence regulation and promoter targeting in mammalian systems. These observations led me to consider why the rbf2 gene is strictly evolutionarily retained throughout the Drosophila lineage, despite the modest observed phenotypes; has the Rbf2 protein gained new functions during evolution, and might the unique C-terminus of Rbf2 contribute to differential targeting? To answer these questions, I carried out parallel ChIP-seq analysis of Rbf1 and Rbf2 in Drosophila embryos. At first, we expected that Rbf2 genome-wide targets might be a subset of Rbf1, based on the canonical Rb-E2F interaction model that Rbf1 binds to both dE2F1 and dE2F2, while Rbf2 binds only to dE2F2. To our surprise, we found that Rbf2 has much more genome-wide targets than Rbf1, and in fact, Rbf1 targets are just a subset of Rbf2. As we noted in our G3 manuscript “this pattern either represents the neofunctionalization of Rbf2 with acquisition of novel gene targets, or alternatively, many of these genes may be bound by the Rbf1 homolog in sister species, with a Rbf2 acquiring some of these interactions through subfunctionalization of Rbf1.” This binding profile of Rbf2 runs contrary to the canonical Rb-E2F model, that Rbf proeins bind to their targets through E2F/DP. Our bioinformatic analysis indicates that Rbf2-only promoters may tend not to have strong E2F-like sites, suggesting that other transcription factors may recruit Rbf2- a property shared with mammalian Rb. In fact, over half of the Rbf2 targets were not associated with E2F binding when compared to another study (Korenjak et al. 2012). It has been noticed that the C-terminal regulatory domains of mammalian Rb proteins partially drive the specificity of these protein interacting with other cofactors. Likewise, the unique C-terminus of Rbf2 may allow it to interact with different types of regulators, other than E2F/DP cofactors. As we further explored the nature of the bound genes, we found Rbf2 targets have diverse functional groups, similar to what we saw for Rbf1 targets. However, what we didn’t observe in Rbf1 is that the majority of ribosomal protein gene promoters were bound by Rbf2. Unlike the potent Rb activity on cell cycle genes, which are shut down by a small amount of Rb overexpression, the Rbf proteins’ repression activity on ribosomal genes is weaker, but widely spread to the majority of the ribosomal genes. We think that ribosomal protein genes are a different sort of target than cell cycle genes – they typically have less variation in expression levels than developmentally-regulated genes, which can be completely off in many settings. It is possible that the transcriptional regulation of ribosomal protein genes by Rb proteins may be subtle, but we think that it would have pleiotropic consequences. Interestingly, none or very few studies have shown any negative regulatory mechanism for ribosomal protein gene expression, it is rather surprising that this group of genes would be controlled only by positive input. Thus, our study offered an aspect of negative regulatory mechanism of ribosomal protein gene expression. Intriguingly, one of the few reported phenotypes for rbf2 mutants may tie into the negative regulation ribosomal protein gene expression: rbf2 null flies lay eggs at a considerably higher rate than wild-type ones. This mild phenotype has been neglected, however, the egg laying is in fact tightly coupled to nutritional signals. Though it may sound good, laying too many eggs under certain conditions may have long-range fitness effects, perhaps reducing lifetime fertility. Therefore, Rbf2 may regulate Drosophila reproduction by fine-tuning the biosynthetic components, such as ribosome protein gene family. An overlooked aspect of previous ChIP sequence data relating to human Rb and related p130 and p107 proteins is their similar enrichment on ribosomal protein promoters (Chicas et al. 2010). Interestingly, the mammalian Rb proteins are known to directly regulate RNA polymerase I and III activity. Together with the ribosomal protein gene regulation, this multi-layer gene regulatory network cover all aspects of ribosome production – what we usually consider as a potent break switch on cell cycle genes may also be regulating by numerous, subtle contributions the biosynthetic capacity of a cell. Clearly an activity relevant to cancer cells! Our findings provide a new view of the impact of Rb proteins in cancer. 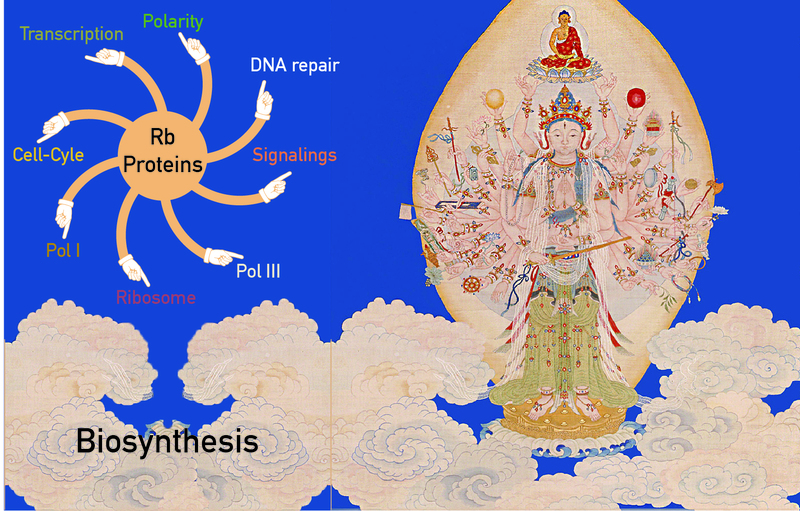 As it turns out, 5000 years of Chinese culture provides an apt analogy for the action of the Drosophila Rbf proteins. 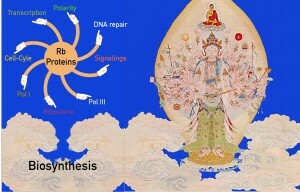 Like Kuan-yin of a Thousand Arms and Eyes from Chinese Buddhism culture, where each hand holds a unique power, the Rb family proteins have reached their “arms” to many aspects of the gene regulatory network. Our studies of Rbf proteins indicate that there are many more functions of Rb, as well as non-canonical mechanisms that recruit Rb proteins to their targets. The appearance of the novel Rbf2 protein on the genome landscape, just as the more recently derived human Rb protein, indicates that gene duplication and diversification contributes to these central processes. Acharya, P., N. Negre, J. Johnston, Y. Wei, K. P. White et al., 2012 Evidence for autoregulation and cell signaling pathway regulation from genome-wide binding of the Drosophila retinoblastoma protein. G3 (Bethesda). 2: 1459–1472. Chicas, A., X. Wang, C. Zhang, M. McCurrach, Z. Zhao et al., 2010 Dissecting the unique role of the retinoblastoma tumor suppressor during cellular senescence. Cancer Cell 17: 376–87. Korenjak, M., E. Anderssen, S. Ramaswamy, J. R. Whetstine, and N. J. Dyson, 2012 RBF binding to both canonical E2F targets and noncanonical targets depends on functional dE2F/dDP complexes. Mol. Cell. Biol. 32: 4375–87. Wei, Y., S. S. Mondal, R. Mouawad, B. Wilczynski, R. W. Henry et al., 2015 Genome-Wide Analysis of Drosophila Rbf2 Protein Highlights Diversity of RB Family Targets and Possible Role in Regulation of Ribosome Biosynthesis. G3 (Bethesda). In press. 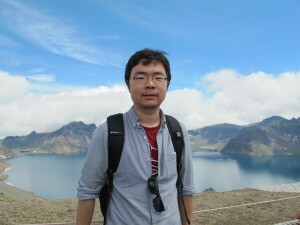 For more information about Yiliang’s work, you can contact him at wyliang1987 at gmail dot com.